Day 2 of the Black Enterprise Women of Power Summit kicked off with attendees owning their truth with keynote speaker Vashit McKenzie, Bishop of the 10th Episcopal District of the AME Church. Bishop McKenzie encouraged attendees to let go of what they can’t control in order to give their full energy to the aspects of their lives that they can control while implementing the necessary changes for their lives to reflect their dreams, starting now. This session concluded with a much needed dance party to Beyonce’s hit, Who Run the World! Piggy-backing off their world takeover excitement, attendees learned to take over their finances with Merrill Lynch, their professional careers with Chevrolet, and their style with Macy’s, via one-on-one Executive Coaching Sessions intended on sharpening their winning edge while fine-tuning long and short-term strategies for success. Continuing in the spirit of success strategies, summit-goers learned how to “play for the win” while mastering high stakes corporate politics prior to learning how to leverage their network to find sponsors who have their backs by vouching for them as they take on their corporate climb. It wouldn’t be a Black Enterprise event without stressed emphasis on financial empowerment and wealth building. Hosted by Merrill Lynch, summit attendees learned what it takes to create financial security now and in the future. Day 2 empowerment continued with the encouragement for attendees to leverage their unique power, their stories, to be used for their advantage and how to keep their careers on track amidst personal crisis. 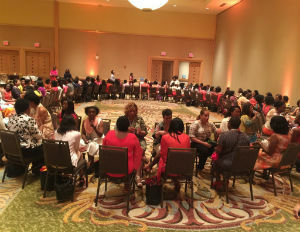 Walmart hosted the summit’s beauty and politics suite, where attendees enjoyed gift bags overflowing with products catering to the African American demographic, including Palmer’s cocoa butter, coconut oil, and skin therapy oil, while discussing social and political issues that affect black women today. Following a brief regrouping, attendees headed over to the Legacy Awards Gala reception featuring remarks by Jackie Thompson; community affairs & grassroots leader of Southwest Airlines, where they networked while sharing summit session takeaways. The evening concluded with the 11th Annual Legacy Awards Gala, celebrating 11 years of trailblazers while honoring the exceptional legacies of golf pioneer, Renee Powell, actress, singer and author, Vanessa Williams, and founder of the Thurgood Marshall College Fund, Dr. N. Joyce Payne who was the recipient of the Barbara Graves Legacy Award. Corporate Vice President, Client Experience and Continuous Improvement of ADP, Debbie Dyson, along with Senior Vice President, Chief Global Diversity and Engagement Officer, PepsiCo, Deborah Rosado Shaw, served as hosts for the remarkable evening.